Summary: With so many options available, what is the best way to recruit solid employees these days? We offer insight from a recent report. There have been some really interesting inventions this year. One that adds a new member to your family is known as Temi. 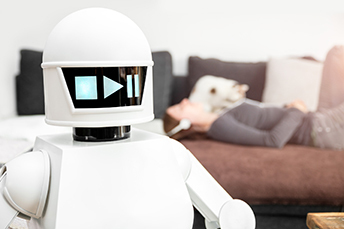 This $1,500 robot runs around the house with you or your family as you do things during the day. It is intelligent, mobile and links to and leverages smart home devices, online content and video communications and is driven by your voice. Temi can turn on lights, order pizza, play music, make a video of what you are doing and call someone on its screen so you can talk to them. While Temi may not yet do everything banks need, this technology points to how things have changed. Look no further than the technology banks use to find good employees. These days, smart phone apps, virtual job fairs, website chats and social media are all some of the ways banks are attracting top talent. But with so many ways to attract job seekers, how can a bank know what really works? To gain clarity, consider a recent report from ManpowerGroup that polled 18,000 individuals ages 18-65 to find out what matters most to them in the job-search process. It turns out that for roughly a third of candidates, social media ads are a preferred method of learning about a job. While only 17% of global candidates have used a smartphone app to search or apply for a job and only 11% have participated in a virtual job fair, texted with a company or chatted on an employer website, a notable 31% of candidates have clicked on a job-related social media ad, according to the study. Remember that LinkedIn is a social media site, so this seems to make sense. Clearly people spend a lot of time using social media these days for news and other information, so it's not particularly surprising that ads on social media have become an important way to target candidates. It may even be a good way to entice candidates that are not on the recruiter's radar. Still, there are subtleties that banks need to understand. First, you need to be able to use the predictive algorithms correctly. A number of forward-thinking companies have begun using predictive algorithms to serve ads based on a user's browsing history (site retargeting) and articles read (contextual retargeting). Candidates benefit because they see more ads that fit their skills and interests; companies benefit because they get data and analytics to help them boost recruitment strategies. The key is setting things up correctly, so you will want to ask some very specific questions about this, if you decide on this option. Banks also have to be careful to ensure that whatever technology they implement solves the problem they want to address. For example, if a bank is trying to find younger candidates, then a social media strategy for recruiting could be compelling. Yet, if the goal is to engage passive candidates for senior positions, another approach may be more effective. Another thing to consider is this: just because technology is helping to identify candidates, doesn't mean it should be used to interview them. Consider that 26% of candidates selected high-touch, in-person interviews as their #1 choice for interacting with a prospective employer, according to Manpower. All of this suggests that companies seeking to engage the right candidates should find a proper technology/high-touch balance in order to attract the right candidates. The Wall Street Journal reported that Bank of England Governor Carney projects Britain could lose 10% of jobs to automation in the coming years, as more positions are replaced by robots and technology. US banks should be on the alert here too; if those projections are correct, they will certainly impact the US as well. Employee Benefit Research Institute (EBRI) research finds the average debt in families in which the head of the household is age 75 or older jumped 21% to $36,757 in 2016 vs. $30,288 in 2010. A survey of small business owners by the National Federation of Independent Businesses (NFIB) finds 38% said they had unfilled job openings last month. This is the highest percentage in 45Ys. JP Morgan is targeting wealthy millennials with its Sapphire card and a bonus of up to 60,000 points. The only criteria - bring in $75,000 or more in deposits or investments and keep it at the bank for at least 3 months. This helps the bank both to bring in millennial customers and increase deposits.